Recently quite a few fitness experts have espoused the benefits of juicing. While I do agree that it can be a good way to increase your produce consumption, if not done correctly it can end up just being an increase in sugar intake with much of the benefits of produce consumption conspicuously absent. If you are using a juicer that removes the pulp of the fruit or vegetable then you are missing out on the benefits of the entire food – the fiber, some vitamins and minerals and even much of the phytonutrients and antioxidants – while giving you a more concentrated sugar intake. In my opinion that is not a winning combination. If you are going to juice produce I would recommend using something like a Vitamix or other high-powered blender that will completely liquify the entire produce so you aren’t just getting the juice and sugar. In addition if you are simply blending the entire thing for added produce to your meals then that is totally cool as long as you keep the calorie content in check. If you are doing this as a meal replacement then I would certainly encourage you to add a quality protein and some healthy fats and not do so for more than 1 meal per day, 2 at most on a day where you need something quick. In the end even if you are blending the entire fruit and/or vegetable, juicing is not the be all end all, it is simply a nice adjunct to a balanced diet based on real, whole, minimally-processed plant and animal foods. In the past I have written about protein bars that I think are an acceptable part of your dietary intake from time to time. These would include JayBars, YouBars and VPX Zero Impact Bars. Well a client referred me to a new bar on the market that I tested myself and thought was quite good – Quest All-Natural Protein Bars. They are higher in protein than either the JayBars or Youbars, contain no artificial sweeteners and is made from mostly real foods. Not to mention they taste pretty good to boot! They are sweetened with stevia, Lo Han Guo and erythritol. Now some of you may have noticed that erythritol is a sugar alcohol, and that makes many people nervous. Fortunately erythritol is different from most sugar alcohols. Rather than the usual 2.4kcal/g of sugar alcohols it only supplies 0.2kcal/g. In addition 90% of it is absorbed by the small intestine and is excreted in the urine and feces, so the majority of it does not pass to the colon and cause GI upset (ie – diarrhea) like most sugar alcohols. Lo Han Guo is another natural sweetener, actually a fruit from China, and is 300 times sweeter than sugar. Due to its high level of sweetness less is needed so it makes a lower-calorie option. It has been used for approximately 1000 years in China for a multitude of purposes. In addition the bars contain 17g of fiber, mostly from isomalto-oligosaccharides (IMO), a prebiotic fiber. While those 17g may scare you away and think you will get a ton of gas, or the prebiotic fiber part may cause the same fear (as the prebiotic inulin is certainly known to cause gas in some people), fortunately for you this prebiotic is a different beast than inulin and is known to cause little gas. IMO naturally occurs in honey, miso and soy sauce and it also provides a level of sweetness for the bar as well. It is digestion resistant and passes into the colon where it is fermented by Bifidobacterium (healthy bacteria), producing short-chain fatty acids, decreasing luminal pH, and inhibiting the growth of dangerous bacteria. Having said all of these wonderful things about these bars, and I didn’t even mention the benefits of its whey protein, I would not recommend consuming this bar or any other on a daily basis. In my mind protein bars should be used only when needed, not as an intentional part of your daily intake, as you are always better off with a completely real food meal. However they work great when you are caught in a pinch or have to eat on the road. They travel well, provide quality protein, healthy fats and are made from quality ingredients. Have a bar with a piece of fruit and some nuts and you have a very tasty and high-quality snack. I recently did an interview with Danny McLarty which covers a lot of topics that I get questions on everyday, so be sure to check it out! In addition a former client of mine sent me a link to this video of the Today Show, where they had tested a bunch of home water filtration systems to see which ones were the most effective. Definitely interesting stuff and further proof that it is in your best interests to filter your drinking water, whether public or private. While my main area of focus is nutrition, and to a slightly lesser extent training, I do like to think of myself as having a broad scope of knowledge in many areas that affect our health, and certainly a passionate interest. I wrote a piece a while back called The Dangers & Solutions of Indoor Air Pollution, which is one of my favorites as I feel it highlights some relatively unknown areas of our lives that could be significantly impacting our health, as well as what to do about it. Well in that same vein some recent research caught my attention. Dr. Anne Steinemann and colleagues at the University of Washington ran tests of scented laundry detergent and dryer sheets and then measured the gases being emitted from the dryer vent for possible carcinogens and health hazards. What they found may surprise you. The first set of laundry that they ran used no products at all. The next used a leading brand of scented laundry detergent, but no dyer sheets in the dryer. The final test got both the detergent and the dryer sheets. What the researchers found was 25 volatile organic compounds (VOCs), which are chemicals that can cause long-term health effects. In addition the EPA classifies seven of these particular VOCs as hazardous air pollutants, and two of them as carcinogens with no safe level of exposure (acetaldehyde and benzene). Even when there weren’t any products in use the vents gave off some VOCs, probably due to the fact that theses were machines in people’s houses and there was some residual matter from previous laundry cycles. When the laundry detergent was added it was much worse, adding 10 new VOCs. When both the scented laundry detergent and the scented dryer sheets were used created by far the worst situation, emitting acetaldehyde, acetone, benzaldehyde, hexanol and many many more hazardous chemicals. Even worse the carcinogenic acetaldehyde was among those with the highest concentrations. The researchers estimate that emissions from dryer vents to equal about 6 percent of the emissions of carcinogenic acetaldehyde from automobiles. While seemingly small, it is also a much more direct exposure, especially if you are venting into your basement or garage. Unfortunately you won’t find these compounds on the ingredients list. The word “fragrance” as a single ingredient can actually contain up to 200 chemicals! It is also proprietary information, does not need to be listed and is not regulated. 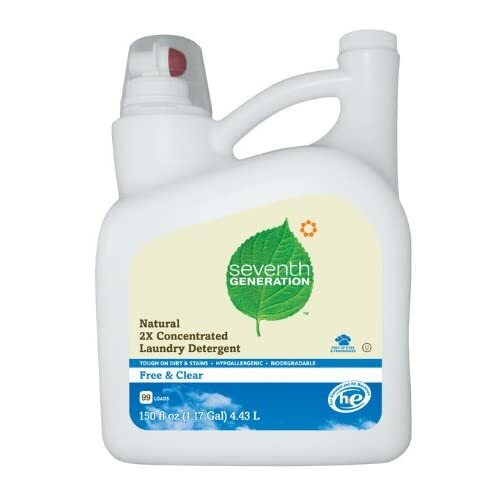 While getting into a discussion on the fact that the emissions from our dryers is a totally unregulated problem is beyond the scope of this blog, the bottom line is your best bet would be to use an unscented, hypoallergenic “natural” laundry detergent, I like Seventh Generation Free & Clear personally, along with an unscented and fragrance free dryer sheet. No your clothes may not have that April fresh scent, but at least they will be far less likely to pose any health risk. Certainly seems like a worthy trade-off to me. Kefir seems to be the popular new kid on the block in the nutrition world. I have received several emails from readers asking my thoughts on it, and several big-name types in the fitness industry have featured it lately. For those who are unaware kefir is a fermented milk product made with a kefir grains. Think of it essentially as an effervescent liquid yogurt. Just like yogurt it is loaded with beneficial probiotics, bacteria that line your digestive tract (mainly your colon) and confer a plethora of health benefits to you. Just like plain yogurt plain kefir is a little sour, however that can be easily remedied with a little protein powder and fruit in a deliciously healthy smoothie. In fact I think this is one of the best ways to consume kefir if you choose to do so. I generally don’t recommend sweetened versions as their sugar content is too high. I prefer to add flavor myself. A big brand-name brand that also gets excellent scores (4 out of 5) from the Cornucopia Institute is Lifeway. They produce an organic whole milk kefir that I think is absolutely top-notch. The nutrition facts are more or less equivalent to regular whole milk though the protein is a teeny bit higher because of the addition of some non-fat milk in the second fermention process. This will provide 39g of protein, 33g of carbs, 10g of fiber, 20g of fat and 468kcal. While there are a lot of claims about kefir and its abilities to improve heath, don’t be sold on it being a miracle food. It is simply another healthy addition to your intake and your digestive tract will thank you for its consumption due to its abundance of probiotic bacteria, many of which are different than those in yogurt, which could provide a nice complement to your yogurt consumption. Alan Aragon’s Research Review is absolutely fantastic stuff. If you are a fitness professional and you do not subscribe you are doing yourself a serious disservice. I know it can be a challenge to keep up on the research yourself, so why not let someone as bright as Alan take care of some of that for you? He breaks down research articles, provides his own review articles on relevant topics (like nutrient timing, saturated fat, grains & inflammation, etc) and delivers a top-notch product every month. Anyway, his November 2011 issue contained a question from a reader who stated that his doctor was concerned about his cholesterol levels being high and was considering putting him on a statin. This reader stated how he follows Alan’s recommendations and hopes its not the three eggs per day and whole fat milk that is giving him such “high” cholesterol. The quotations are mine and you will see why in a moment. Does anybody see what is wrong with this picture? His doc is concerned because his total cholesterol is elevated, but this is simply because his HDL (considered good cholesterol) is through the roof! A level above 60 is desirable, and he is far above that, which significantly reduces his risk of cardiovascular disease. In addition Alan astutely points out that the ratio of total cholesterol to HDL is a better predictor of heart disease risk than total cholesterol or LDL cholesterol (often called bad cholesterol, though that is somewhat misleading) alone. In men a ratio of 5 is average risk, while a ratio of 3.4 cuts your risk in half. This guy’s ratio is 2! Alan also points out that a recent study stated that the triglyceride to HDL ratio is the “single most powerful predictor of extensive coronary heart disease among all the lipid variables examined.” It was found to be even more powerful than the aforementioned TC/HDL. The goal of the triglyceride to HDL ratio is 2 or lower. The reader’s score was 0.2! As you can clearly see this guy’s doctor is missing the forest for the trees. Where he only sees high total cholesterol, the numbers actually show that this guy has an excellent cholesterol panel (from what these numbers show us anyway) and absolutely, positively does not need a statin. For a more detailed breakdown of this scenario, and just for consistently good breakdown of current and past research, do yourself a favor and subscribe to Alan’s Research Review, you will be glad you did. Clearly 3 whole eggs and whole milk were not a problem for this guy! The point of all of this was to encourage you to educate yourself prior to seeing your doctor. Doctor’s are smart people, but that doesn’t mean they know everything. It is ok to gather data and be an informed patient. In fact I think it is imperative because if you are not an advocate for yourself, who will be?